My new secret pattern is now ready! I decided to enter it in the Holiday Softies contest, so I had the motivation to get it finished a lot sooner than I might have otherwise. My original idea was for a unicorn/horse, but that wasn't quite in the spirit of the contest, so I decided to make a reindeer instead. I think he turned out very handsome, and he's cuddly too! He is much bigger than my other toys, at about 16 inches tall and 12 inches long. He also takes longer to knit and is more complicated to put together. I have tried to make the instructions as clear and helpful as possible, but I would appreciate any advice from the first few people to make this toy. 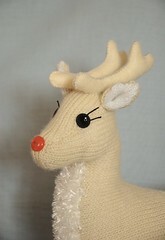 The pattern will be available in my Etsy shop as soon as I can get it listed, and in my Lulu shop shortly after that. I still want to make a unicorn and a horse, so those patterns will be coming along in the next couple months. I know there were a few people that wanted to be on my mailing list for new patterns, but I seem to have misplaced one of the emails. Oops :( Could you leave me a comment on this post, or send me an email, if you would like to be added to the list? That is such an amazing awesome toy Barbara! October 22, 2007 at 12:48 a.m.